Background and Aims: Antibodies to infliximab reduce serum infliximab with loss of clinical benefit, but undetectable trough serum concentrations of infliximab may occur without antibody formation. The relationship between trough serum infliximab and clinical outcomes was evaluated in acute ulcerative colitis. Methods: In a cohort of 115 patients with ulcerative colitis treated with three-dose induction followed by scheduled maintenance infliximab, rates of clinical remission, colectomy, antibodies to infliximab and trough serum infliximab were determined. Results: Rates of remission were 32% at week 10 and 37% at week 54. Colectomy occurred in 40% of patients, at a median of 5.3 (IQR 1.9–12.1) months. Detectable trough serum infliximab was present in 39% of patients and, among patients with undetectable infliximab, 41% were antibody positive and 20% were antibody negative. For antibody-positive and antibody-negative patients, rates of remission (18% vs 14%), endoscopic improvement (25% vs 35%) and colectomy (52% vs 59%) were not different. A detectable serum infliximab was associated with higher rates of remission (69% vs 15%; p<0.001) and endoscopic improvement (76% vs 28%, p<0.001). An undetectable serum infliximab predicted an increased risk for colectomy (55% vs 7%, OR 9.3; 95% CI 2.9 to 29.9; p<0.001). Concurrent immunosuppression was not associated with clinical outcomes. Conclusions: For patients with ulcerative colitis treated with infliximab, a detectable trough serum infliximab predicts clinical remission, endoscopic improvement and a lower risk for colectomy. An undetectable trough serum infliximab, irrespective of antibody status, is associated with less favourable outcomes. We studied the relationship between trough serum concentrations of infliximab and antibody formation on clinical outcomes, including the rates of clinical remission, endoscopic improvement and colectomy, in patients with moderately severe to severe, steroid-refractory acute UC treated with three-dose induction followed by scheduled maintenance infliximab. 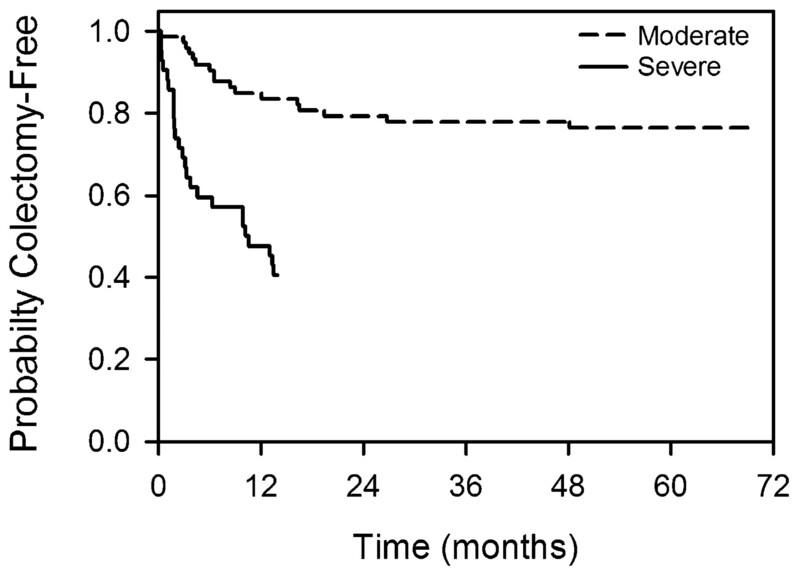 A consecutive cohort of 115 patients with moderately severe to severe UC who initiated infliximab treatment between March 2001 and April 2008 were studied. The diagnosis of UC was made using established clinical, endoscopic and histological criteria. The induction protocol was infliximab 5 mg/kg at 0, 2 and 6 weeks. Patients responding to induction infliximab received 5 mg/kg infliximab at scheduled intervals of 8 weeks. Adjustment of the infusion interval to 6 or 7 weeks and/or an increment of the dose to 10 mg/kg infliximab were undertaken at the discretion of the treating physician. Concomitant additional treatment for UC with mesalamine (4.0–4.8 g/day) and azathioprine (2.0–2.5 mg/kg/day) was administered as indicated. The study was approved by the institutional Research Ethics Board and all patients gave written informed consent. Clinical evaluations included age, gender, disease location and duration, smoking status, concurrent use of mesalamine and azathioprine, and dose and duration of corticosteroids. Tuberculosis was excluded in all patients by a negative PPD (purified protein derivative) skin test and a normal chest x ray. Patients were assessed at baseline, prior to each induction infusion and at ⩽4 month intervals prior to maintenance infusions. Complete blood count, chemistry tests (liver and renal profile), albumin, CRP, pANCA status and stool tests to exclude enteric pathogens and Clostridium difficile were performed. Baseline UC disease activity was measured by the Mayo score.13 Severe disease was defined as a hospitalised patient, refractory to intravenous corticosteroid treatment for ⩾7 days and a Mayo score of ⩾10 points. Moderately severe disease was defined as the absence of a clinical response to at least 40 mg of prednisone orally for ⩾10 days and a Mayo score of ⩾6 points. Colonoscopy was performed within 2 months prior to the baseline infusion in all patients, and 109 patients consented to one or more follow-up examinations; 65 studies were performed after induction treatment, prior to week 14. An endoscopic activity score13 was calculated for each examination by the treating physician and by one additional investigator (CS), with a consensus score recorded. The endoscopic disease activity score ranges from 0 to 3, with 0 denoting normal mucosa, 1 granular mucosa with an abnormal vascular pattern, 2 friable mucosa with spontaneous bleeding and occasional microulceration and 3 gross friability and ulceration. A clinical response was defined as a decrease in a partial Mayo score (without endoscopic findings) of ⩾3 points and at least 30% from the baseline score. Clinical remission was defined as a partial Mayo score of 0 and the absence of corticosteroid treatment for ⩾4 weeks. Endoscopic improvement was defined as a reduction in the follow-up endoscopic score of at least one point compared with baseline. Endoscopic remission was defined as normal mucosa with disappearance of all mucosal lesions. Side effects were recorded, including the rate of early infusion reactions. Concentrations of infliximab and antibodies against infliximab were evaluated in 108 patients from serum samples drawn immediately before an infusion in those who received maintenance treatment with a median interval from the baseline infusion of 10.7 (interquartile range (IQR) 6.3–18.4) months and in the event of early discontinuation related to colectomy or lack of benefit, within 8 weeks after cessation of infliximab (median interval from baseline infusion of 3.5 (IQR 2.5–3.5) months). Twenty-three consecutive patients had additional samples taken at 1, 2, 4, 6 and 14 weeks from the baseline infusion. Twenty-five patients who received maintenance treatment were randomly selected for a repeat analysis on a second preinfusion sample drawn a median of 20 weeks (range 8–56 weeks) after the first sample. Serum infliximab and antibodies against infliximab (Prometheus Laboratories, San Diego California, USA) were assessed blindly in duplicate, as described previously.12 Antibodies against infliximab were reported as negative when the concentration was <1.69 μg/ml and the serum infliximab was <1.40 μg/ml, and as positive when the concentration exceeded 1.69 μg/ml and the serum infliximab was <1.40 μg/ml. An inconclusive result was reported when the serum infliximab was >1.40 μg/ml, because infliximab interferes with the antibody against infliximab assay and antibody formation cannot be determined. Comparison of differences within a group was performed by using the Student paired t test for normally distributed data and the Wilcoxon signed rank sum test for non-normally distributed data. Differences between groups were assessed by analysis of variance (ANOVA) or the Kruskal–Wallis ANOVA on ranks as appropriate. Categorical data were compared with the χ2 test or Fisher exact test. Logistic regression was used to examine predictors of clinical remission and colectomy. The primary variable of interest was the presence of detectable trough serum infliximab. Other variables included gender, age, disease location, disease duration, baseline Mayo score ⩾10, use of prednisone for ⩾1 year prior to infliximab, use of concurrent azathioprine, pANCA status, baseline CRP >5 mg/l and the presence of antibodies to infliximab. Time to colectomy was analysed by the Kaplan–Meier method. p Values <0.05 were considered significant. Statistical analysis was performed by using SAS (version 9.1.2; SAS Institute, Cary, North Carolina, USA). Baseline characteristics of the 115 patients are shown in table 1. The indication for infliximab was severe disease in 42 patients and moderately severe disease in 73 patients. The median baseline Mayo score for severe patients (11 points; range 10–12) was higher than for moderately severe patients (8 points; range 6–10) (p<0.001). The median dose of corticosteroids (prednisone equivalents) was 40 mg/day and 26 patients (23%) were receiving concurrent azathioprine. Of the 115 patients who initiated infliximab induction treatment, 59% (68/115) had a clinical response and 32% (37/115) achieved a clinical remission at week 10. Patients with moderately severe compared with severe UC had a higher rate of clinical response (70% vs 41%; p = 0.004) and clinical remission (41% vs 17%; p = 0.015). Endoscopic remission occurred in 17% (11/65) of evaluated patients. The rate of endoscopic remission was higher for patients with moderate than for those with severe UC (26% vs 4%; p = 0.046). Among 22 patients who discontinued infliximab after ⩽3 infusions, three (infusion reaction, n = 1; lack of benefit n = 2) received other medical treatments and 19 had a colectomy. Fourteen (13 severe and 1 moderate) of the 115 patients (12%) underwent colectomy by week 10. Ninety-three of 115 patients (81%) treated with induction infliximab received one or more maintenance infusions (median 5 infusions; IQR 3–10) over a median period of 13.9 (IQR 6.4–22.3) months. At week 54, 48% of patients (55/115) achieved a clinical response and 37% (43/115) of patients were in steroid-free clinical remission. Patients with moderate compared with severe UC had a higher rate of clinical response (60% vs 29%; p = 0.003) and clinical remission (45% vs 19%; p = 0.009). The proportion of patients in clinical remission was similar with and without concurrent mesalamine (49% vs 48%; p = 0.94) and azathioprine (49% vs 46%; p = 0.97). Endoscopic improvement occurred in 55% (60/109) of patients and endoscopic remission was achieved in 16 (15%) patients. Infliximab was discontinued in 52% (60/115) of patients over the 13.9 month follow-up period. Forty-six of 115 patients (40%) required colectomy at a median of 5.3 (IQR 1.9–12.1) months from the baseline infusion, with 38 patients (33%) having undergone colectomy by week 54. The colectomy rate was higher for patients with severe compared with moderate UC (60% vs 29%; p = 0.002) and occurred at a shorter median time (2.8 vs 9.1 months; p = 0.001) (fig 1). The indications for discontinuation in the 14 non-colectomy patients receiving other medical treatment included infusion reaction (n = 5), lack of clinical benefit (n = 7), pregnancy (n = 1) and loss of follow-up (n = 1). Kaplan–Meier analysis of risk for colectomy in severely active (—) and moderately severe ulcerative colitis (- - -). Log rank test showed that colectomy risk was significantly different between groups (p<0.001). An undetectable trough serum concentration of infliximab occurred in 66/108 (61%) patients, of whom 44 (41%) were antibody positive and 22 (20%) were antibody negative. Among the 44 patients with antibody formation, 33 (75%) had a titre of ⩾8.0 μg/ml and 16 (36%) had developed antibodies with ⩽3 infusions. The incidence of antibody formation was similar with and without concurrent immunomodulators (40% vs 41%; p = 0.88). Forty-two patients (39%) were antibody inconclusive with a detectable trough serum infliximab (median 6.5 μg/ml; IQR 3.2–9.8 μg/ml). The median trough serum infliximab did not differ for inconclusive patients treated with and without concurrent immunomodulators (6.5 vs 6.3 μg/ml; p = 0.46). The proportion of patients with detectable infliximab tended to be lower with more severe disease activity but the difference for patients with baseline Mayo scores of <10 or ⩾10 (46% vs 27%) did not reach significance (p = 0.071). Among 25 patients who had repeat trough serum infliximab measurements, there was complete concordance between the two results for 17 patients with detectable infliximab (median 6.8 vs 6.1 μg/ml; p = 0.31) and 3 patients with antibodies to infliximab; 4 of 5 antibody-negative patients remained negative and 1 became antibody positive. Seventeen patients (15%) had early infusion reactions, of whom 10 (59%) were antibody positive. Adjustment of the infusion interval from 8 weeks to a median of 6 (range 6–7) weeks occurred in 54 patients, of whom 24 (44%) achieved a clinical remission. The median trough serum infliximab was not different between patients receiving infliximab infusions at intervals of 6–7 weeks and 8 weeks (5.8 vs 7.6 μg/ml; p = 0.52). Among 20 patients dose escalated to 10 mg/kg infliximab, 5 (25%) achieved clinical remission, of whom 4 had detectable trough serum infliximab and 1 was antibody positive. Of the 15 patients without remission, serum infliximab was undetectable in 13 (8 antibody positive and 5 antibody negative), and 2 patients had detectable serum infliximab (median 2.7 μg/ml). Clinical outcomes assessed according to antibody status are shown in fig 2. The rates of clinical remission were not different between antibody-positive patients and antibody-negative patients (14% vs 18%; p = 0.95) and were lower than the rate of 69% for inconclusive patients (p<0.001; fig 2A). Rates of endoscopic improvement from baseline also were not different between antibody-positive and antibody-negative patients (25% vs 35%; p = 0.61) and were less than the rate of 76% for inconclusive patients (p = 0.004; fig 2B). Conversely, the similar colectomy rates for antibody-positive and antibody-negative patients (52% vs 59%; p = 0.78) were higher than the colectomy rate of 7% for inconclusive patients (p<0.001; fig 2C). Clinical outcomes according to antibody to infliximab status. The proportion of patients with (A) clinical remission defined as a Mayo score of 0 and discontinuation of prednisone for ⩾4 weeks; (B) endoscopic improvement defined as a reduction in the follow-up endoscopic score of at least 1 point from the baseline to the follow-up evaluation; and (C) colectomy. Clinical outcomes evaluated by antibody status related directly to the presence (antibody inconclusive) or absence (antibody-positive and antibody-negative patients) of trough serum infliximab (fig 2). In accord with these findings, strong associations were identified between the trough serum infliximab concentration and clinical outcomes. Patients with a detectable serum infliximab concentration compared with those in whom the trough serum infliximab was undetectable had higher rates of clinical remission (69% vs 15%; p<0.001; fig 3A), endoscopic improvement (76% vs 28%; p<0.001; fig 3B) and endoscopic remission (27% vs 8%; p = 0.021), and a lower rate of colectomy (7% vs 55%; p<0.001; fig 3C). Clinical outcomes according to the presence and absence of a detectable trough serum infliximab concentration. The proportion of patients with (A) clinical remission defined as a Mayo score of 0 and discontinuation of prednisone for ⩾4 weeks; (B) endoscopic improvement defined as a reduction in the follow-up endoscopic score of at least 1 point from the baseline to the follow-up evaluation; and (C) colectomy. Results of univariate analysis for factors that could potentially influence outcomes indicated that the baseline Mayo score, antibodies to infliximab and the trough serum concentration of infliximab were associated with clinical outcomes (table 2). Concurrent immunosuppression did not influence rates of clinical remission or colectomy. Multivariable logistic regression analysis showed a detectable trough serum concentration of infliximab to be a significant positive predictor for clinical remission (odds ratio (OR) 12.5; 95% CI 4.6 to 33.9; p<0.001) and endoscopic improvement (OR 7.3; 95% CI 2.9 to 18.4; p<0.001). Remission was also associated with a baseline Mayo score <10 (OR 3.1; 95% CI 1.1 to 9.1; p = 0.041) and lack of prednisone dependence ⩾1 year prior to infliximab (OR 5.1; 95% CI 1.3 to 20.2; p = 0.019). Conversely, an undetectable trough serum infliximab concentration was a significant positive predictor for colectomy (OR 9.3; 95% CI 2.9 to 29.9; p<0.001). A baseline Mayo score ⩾10 was also associated with an increased risk for colectomy (OR 3.3; 95% CI 1.2 to 9.1; p = 0.018). Although infliximab is now a mainstay treatment for refractory Crohn’s disease, results from clinical trials of infliximab for acute UC have been variable.6 Thus, identifying factors that maximise the clinical benefit of infliximab for acute UC is an important therapeutic goal. The present study shows that clinical outcome for corticosteroid-refractory patients with UC treated with infliximab is strongly related to the trough serum concentration of infliximab. Clinical remission and endoscopic improvement were similar for antibody-positive and antibody-negative patients, two groups characterised by undetectable trough serum infliximab, and were significantly lower than for inconclusive patients, the group with detectable serum concentrations of drug. Moreover, an undetectable trough level of infliximab was a strong predictor for need for colectomy, whether or not antibodies were present. Together, these findings indicate an important relationship between the trough serum concentration of infliximab and clinical benefit for acute UC patients. Because undetectable infliximab levels occur independently of the presence of antibodies against infliximab, in clinical practice the trough serum infliximab concentration may provide a more useful guide for optimising clinical outcome. In this context, a positive antibody result would be considered a surrogate marker for the absence of drug. After induction infliximab, our clinical remission rate of 32% at week 10 accords with the mean remission of 40% reported in a summary analysis of UC–infliximab trial studies,14 indicating that infliximab is moderately effective for induction treatment of corticosteroid-refractory moderately severe active UC. Clinical impact also requires long-term corticosteroid-free remission, and outcome data for maintenance infliximab treatment in UC are more limited. With scheduled 8 weekly 5 mg/kg infliximab, in the ACT I trial steroid-free remission of 25% was achieved after 54 weeks,8 whereas in a cohort study of 39 patients a higher 55% remission occurred after a mean duration of 16.8 months.15 Overall, 37% of our patients had steroid-free remission at week 54. As in the ACT trials,16 disease severity was one factor influencing outcome. For patients with a Mayo score ⩽10, the steroid-free remission rate of 45% at 54 weeks reaffirms a clinically relevant benefit of infliximab in moderately severe UC. Conversely, the most significant predictor for colectomy was an undetectable serum infliximab, which carried a ninefold increased risk of surgery. This association was often an early event at ⩽6 weeks during induction treatment. In the Jarnerot study17 trough serum infliximab levels were not reported, but given the similar rates of colectomy, the composite findings suggest single or three-dose induction of 5 mg/kg infliximab may not be the optimal strategy for avoiding colectomy in all patients with acute UC, notably those with a Mayo score ⩾10. Whether an induction regimen incorporating a higher infliximab dose and shorter interval predicated on sustained trough serum concentrations of infliximab reduces the requirement for colectomy warrants study. Notwithstanding scheduled treatment, 41% of our patients developed antibodies to infliximab, a value almost twofold higher than studies in Crohn’s disease11 12 and the ACT trials.8 The higher rate of antibody formation related, in part, to the prevailing concentration of infliximab, with an undetectable serum infliximab preceding antibody formation. This finding confirms observations in rheumatoid arthritis indicating that a low or absent trough serum infliximab is a precursor for the development of antibodies to infliximab.21 Our results also support findings in Crohn’s disease22 where a serum infliximab of <4 μg/ml measured 4 weeks after the first infusion has a positive predictive value of 81% for antibody formation later in the course of treatment. The high proportion of patients with acute UC with absent trough levels of infliximab was unexpected and contrasts with our study in Crohn’s disease.12 The factors predisposing to this finding are uncertain, but a plausible explanation relates to more rapid clearance of infliximab. Although pharmacokinetic studies indicate that infliximab clearance is similar in rheumatoid arthritis, ankylosing spondylitis and Crohn’s disease,23 24 studies specific to UC have not been reported. In ankylosing spondylitis, clearance is not altered by disease activity,23 but in our study the proportion of patients with detectable infliximab tended to be lower for patients with more severe disease activity. It remains possible that disease-specific factors(s) promote early formation of immune complexes in infliximab-treated patients with acute UC and impact on clinical outcome by reducing drug levels. Although our analysis included steady-state single sampling, this approach provides valid pharmacokinetic parameter estimates.25 As reported previously for patients treated with maintenance infliximab,11 19 20 we found considerable interindividual variation in trough serum concentrations of infliximab, but, within patients, serum infliximab levels and antibody status remained relatively constant over time with infusions at regular scheduled intervals. Clinical outcomes were independent of concurrent treatment with azathioprine. The ACT trials also pointed to a lack of additional benefit for patients receiving immunomodulators with infliximab.8 For immunomodulatory-naïve patients, uncontrolled observations26 indicated that the outcome at 12 months after a single induction dose of infliximab followed by maintenance azathioprine alone was similar to the outcome with maintenance infliximab in the ACT trials.8 Whether maintenance infliximab is a prerequisite for long-term remission is under prospective study in a trial of azathioprine-naïve, infliximab-responsive patients with UC to evaluate azathioprine alone, infliximab alone and the combination. In conclusion, infliximab is beneficial and safe for patients with acute UC, particularly those with moderately severe steroid-refractory disease. The presence of detectable trough serum infliximab predicts clinical remission, whereas patients with undetectable infliximab are more likely to require colectomy. Factors in addition to antibody formation, probably pharmacokinetic, modulate serum concentrations of infliximab and impact on clinical benefit. Thus, the trough serum infliximab level appears to be a more useful predictor of clinical outcome than the presence of antibodies to infliximab, as it also takes into account the variable elimination of infliximab from the circulation. Mechanisms underlying the high proportion of UC patients with undetectable serum trough infliximab remain an area for further investigation, but the finding does suggest that evaluation of higher induction dosing at shorter infusion intervals, particularly for severe UC, may be warranted. We thank Joanne Stempak for expert technical assistance and all the patients for participating in the study.
. Ulcerative colitis and clinical course: results of a 5-year population-based follow-up study (the IBSEN study). Inflamm Bowel Dis 2006;12:543–50.
. Long-term colectomy rate after intensive intravenous corticosteroid therapy for ulcerative colitis prior to the immunosuppressive treatment era. Am J Gastroenterol 2007;102:2513–9.
. Long-term outcome of treatment with intravenous cyclosporin in patients with severe ulcerative colitis. Inflamm Bowel Dis 2004;10:73–8.
. A short-term study of chimeric monoclonal antibody cA2 to tumor necrosis factor α for Crohn’s disease. N Engl J Med 1997;337:1029–35.
. Maintenance infliximab for Crohn’s disease: the ACCENT I randomized trial. Lancet 2002;359:1541–49.
. Tumour necrosis factor alpha blocking agents for induction of remission in ulcerative colitis. Cochrane Database Syst Rev 2006;3:CD005112.
. Infliximab in moderately severe glucocorticoid resistant ulcerative colitis: a randomized trial. Gut 2003;52:998–1002.
. Infliximab for induction and maintenance therapy for ulcerative colitis. N Engl J Med 2005;353:2462–76.
. Predictors of early response to infliximab in patients with ulcerative colitis. Inflamm Bowel Dis 2007;13:123–8.
. Influence of immunogenicity on the long-term efficacy of infliximab in Crohn’s disease. N Engl J Med 2003;348:601–8.
. Incidence and importance of antibody responses to infliximab after maintenance or episodic treatment in Crohn’s disease. Clin Gastroenterol Hepatol 2004;2:542–53.
. Association of trough serum infliximab to clinical outcome after scheduled maintenance treatment for Crohn’s disease. Clin Gastroenterol Hepatol 2006;4:1248–54.
. Coated oral 5-aminosalicylic acid therapy for mildly to moderately active ulcerative colitis. A randomized study. N Engl J Med 1987;317:1625–9.
. Systemic review: infliximab therapy in ulcerative colitis. Aliment Pharmacol Ther 2006;25:19–37.
. Experience of maintenance infliximab therapy for refractory ulcerative colitis from six centres in England. Aliment Pharmacol Ther 2009;29:308–14.
. Infliximab treatment for ulcerative colitis: clinical response, clinical remission and mucosal healing in patients with moderate or severe disease in the active ulcerative colitis trials (ACT 1 & ACT 2) (abstract). Gastroenterology 2008;134:T1142.
. Infliximab as rescue therapy in severe to moderately severe ulcerative colitis: a randomized, placebo-controlled study. Gastroenterology 2005;128:1805–11.
. A 2-year follow-up of the Swedish–Danish infliximab/placebo trial in steroid resistant ulcerative acute colitis (abstract). Gastroenterology 2007;132:983.
. Infliximab induction and maintenance therapy for moderate-to-severe psoriasis: a phase III, multicentre, double-blind trial. Lancet 2005;366:1367–74.
. The relationship of serum infliximab concentrations to clinical improvement in rheumatoid arthritis. Results from ATTRACT, a multicenter, randomized, double-blind, placebo-controlled trial. Arthritis Rheum 2002;46:1451–59.
. Therapeutic efficacy of multiple intravenous infusions of anti-tumor necrosis factor alpha monoclonal antibody combined with low-dose weekly methotrexate in rheumatoid arthritis. Arthritis Rheum 1998;41:1552–63.
. Effectiveness of concomitant immunosuppressive therapy in suppressing the formation of antibodies to infliximab in Crohn’s disease. Gut 2007;56:1226–31.
. Population pharmacokinetics of infliximab in patients with ankylosing spondylitis. J Clin Pharmacol 2008;48:681–95.
. Relationship between infliximab pharmacokinetics and improvement in Crohn’s disease (abstract). Gastroenterology 2002;122:W1364.
. Clinical pharmacokinetics of tumor necrosis factor antagonists. J Rheumatol 2005;32(Suppl 74):13–18.
. Use of infliximab in the prevention and delay of colectomy in severe steroid dependent and refractory ulcerative colitis. World J Gastroenterol 2008;14:2544–9. Funding This study was supported by the Campacci Research Fund for Inflammatory Bowel Disease of the Mount Sinai Hospital. CHS was supported by the Richard Walter Gibbon Medical Research Fellowship from the University of Western Australia. Ethics approval Ethics approval was obtained from the Mounr Sinai Hospital Review Ethics Board. BMJ Publishing Group Ltd and British Society of Gastroenterology. All rights reserved.